It’s opening weekend at the California Science Center, and nearly 12,000 visitors have made the pilgrimage to gaze at artifacts from a worldwide star who is both well-known and a mystery—not bad for a guy who’s been dead for about 3,300 years. The California Science Center is presenting the world premiere of “King Tut: Treasures of the Golden Pharaoh.” It is the largest King Tut exhibition that has ever toured and it includes 150 artifacts from Tutankhamun’s tomb. Sixty of those rare objects had never traveled outside of Egypt before. The exhibit, produced by IMG, is also celebrating the upcoming centenary of the tomb’s discovery. 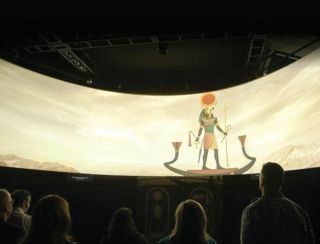 Immersive multimedia technologies complement the precious treasures to take guests on a journey of the pharaoh’s life and death, and Tut’s “quest for immortality.” This is next-level storytelling at its most creative, and AV is playing an integral role. The dual-level exhibit boasts three immersive gallery theater “experiences” as well as an assortment of artifacts. King Tut’s burial jewelry and transportation for his next life are a part of the exhibit, and high-tech theater experiences immerse exhibitgoers in the story of Tut’s journey through the underworld to the afterlife, bridging the gap between life and death. The main theater sets the stage for an immersive experience for more than 50 museum visitors at any one time. Displays and multimedia presentations explore the history and work of archeologist and Egyptologist Howard Carter, who discovered the tomb in 1922. The burial objects are presented in the context of the Egyptian belief system. In a fascinating nod to modern culture, some displays highlight how subsequent CT scans and DNA analysis of the King’s mummy have revealed new information about Tut’s life, and further explanation about his mysterious death. So how does a museum today show these priceless artifacts and tell the stories of Tut and his discoverer Howard Carter? It wasn’t easy, as the exhibit’s galleries span two floors of the museum featuring immersive and automated theater experiences. A trove of advanced audio-video technology and control brings visitors closer to the Golden Pharaoh’s experience. Visitors first enter a theater space with a 23-footwide by 7-foot-high curved and acoustically trans parent screen displaying edge-blended images from three 4K Barco laser projectors. “That sets the stage for the entire exhibition,” said Paul Watanabe, assistant deputy director of operations at California Science Center. Visitors are treated to a four-minute film immersing them in the sights and sounds of this important piece of history. The main theater screen surrounds the Design Electronics team—Felice Taddeo, manager of technical services, Khalil Williams, general manager, and Scott Daeng, senior project engineer—which provided the AV supply and integration for the King Tut exhibits. A perforated screen was used so the audio from the speakers located behind it can permeate through to the audience. “That gives you the extra immersive impact of the sound emanating directly from the source image,” Watanabe said. Laser projectors are the new gold standard for creating high-quality commercial theater experiences. Experience creators want the same quality and immersive experience they get in a movie theater to be part of these experiential adventures. (See spotlight below.) A secondary gallery treats visitors with another theater experience—this one about the events leading to the discovery of Tutankhamun’s tomb. “A really interesting effect shows the depth of walking down into a tomb, while at the same time showcasing the famous wishing cup, one of the stars of the show,” Watanabe said. Imagery and audio in two smaller theaters continue the dynamic, immersive experience throughout the exhibit. The third theater experience explores King Tut’s impact on modern culture, media, and everyday life. Display artifacts and presentations paint the picture of Tut’s story in a way that uses sound and projection technology to enhance these priceless artifacts, rather than stealing the show. Custom content enhances how the artifacts are displayed and how the museum conveys the information with a multimedia rather than hands-on experience. “It’s a little bit of a challenge, with this size exhibition. It’s a bit more advanced than what we’re accustomed to,” Watanabe said. Design Electronics worked with exhibit designer, Fricker Studios, the IMG team, and fabricator Cinnabar to develop a custom screen for the wishing cup. Various materials were tested for the ability to project on and create an opaque surface while projected. This, combined with backlighting from designer Brad Malkus of Lightswitch, created transparency leading a museum visitor to an immersive 3D reveal into King Tut’s tomb. “The laser technology also means no maintenance for the course of the five-year internationally touring exhibition,” Williams added, happily. So how do you network three galleries providing high-tech AV experiences on different floors of a museum? For the electronic integrators, the pathways to networking everything must have seemed like navigating a pyramid’s labyrinth. Many of the source devices are housed in centralized equipment racks. “HDBaseT provided a key benefit for display technology located around and above priceless artifacts; this, combined with no-maintenance laser projectors, allows for typical service to occur safely behind the scenes,” he said. The equipment racks were divided into configurable modules. “Using BSS Blu-Link, we were able to minimize the length of cable pulls to speakers, and the modular racks could be located within the best proximity to the majority of audio,” Williams said. “This flexibility also allows us to reconfigure the system when the venue layout changes. Cindy Davis is a regular AV Technology contributor. Margot Douaihy, AV Technology’s editor-at-large, contributed to this story. A common challenge in museum applications is the placement of the projectors into the existing infrastructure. It could be in an old building with stone walls, high ceilings, and with limited possibility to make structural changes. In a public space, the projectors are expected to provide maximum visibility and exposure of the content, without themselves being visible or audible to the public. As a consequence, mounting flexibility becomes important. The need to hide the projector in the ceiling structure, to project directly up or down, front or rear, and often with the desired screen surface at an off-axis angle, calls for a flexible solution. The Barco F80 series’ shift and offset capabilities remedy these pain points in applications of this ilk. The lens options for the Barco F80 series include support for two lens series: FLD/FLD+ and GLD. The FLD/FLD+ range is already in use on Barco F3x series (former projectiondesign F3x series) as well as the F90 and F70 platforms and can be reused on the F80. The GLD series is a new, more compact , and optimized lens range designed specifically for F80. With a huge selection of fixed and zoom lenses, they can cover any throw ratio from 0.42:1 to 9.75 :1. The lens shift capabilities vary with each lens, with a maximum shift of 142 percent. This gives designers flexibility in positioning the projector without suffering the artifacts of electronic image distortion (keystone), or having to put the projector in an undesirable spot. For more info on the F80, lenses, and peripherals, visit www.barco.com/F80. Info courtesy of Barco.